Bol-anon: Who is Francisco Dagohoy? I would like to tell you about one of the greatest, if not the greatest, Boholano icons of all time. Francisco Dagohoy led the longest revolt in Philippine history against the Spanish colonial government. This took place in Bohol from 1744 to 1829, roughly 85 years. Here are some less known facts/trivia about the man. His real name was Francisco Sendrijas and he was a native of Inabanga, Bohol. He was actually a cabeza de barangay or one of the barangay captains of the town. The name Dagohoy was derived from his local alias “dagon sa hoyohoy” translated in English as "amulet or charm of the gentle wind" that people believed he possessed. The Dagohoy revolt was triggered by the refusal of the Jesuit priest, Fr. Morales, to give a Christian burial to Sagarino, Dagohoy's brother, a constable who died in service while chasing a fugitive. The signal of the uprising was the killing of Father Giuseppe Lamberti, curate of Jagna on January 24, 1744. Shortly afterwards, Father Morales was killed by Dagohoy. Dagohoy established a free government in the mountains and had followers which at the height of the revolt reached 20,000. The patriots remained unsubdued even after Dagohoy's death. 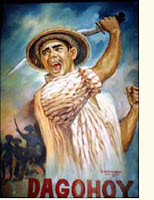 Dagohoy defeated the Spanish-Filipino forces sent against him. Twenty Spanish governors-general, from Gasper de la Torre (1739–45) to Juan Antonio Martinez (1822–25), tried to quell the rebellion and failed. The revolt was finally subdued in 1829, after a campaign by Spanish expedition under Captain Manuel Sanz landed in Bohol and fought for more than a year. The Francisco Dagohoy Cave in the town of Danao was the headquarters of Dagohoy and one of its many passages had an underwater route. It is said that every time Spaniards searched the cave, he would swim underwater to hide in the breathing space. Hundreds of Dagohoy's followers preferred death inside the cave than surrender. Their skeletons still remain in the site. It has been some time since I have read from your blog. Thanks for Dagohoy's trivia. Do drop by my blog when you have time. Thank you for posting this Very important and a relevant trivia about my great grandfather " Francisco Dagohoy".